To do this, an agreement was made between Manitoba Hydro, Qualico and the City of Winnipeg. The property is private land that is owned by Manitoba hydro but Qualico was able to develop the space by creating elevation changes, placing in trails and incorporating native plants and grasses into the area. Once complete, the land is to be maintained by the City of Winnipeg as a public space although it is privately owned. Landscaping the hydro corridor has made it a better fit with the style of Sage Creek’s community. Since Manitoba has flat prairie land, elevation changes were added to the surrounding area to create different terrain. However, as per Manitoba Hydro regulations, the land where the existing and future power lines stand, remains untouched. As development progresses, Sage Creek has gradually wrapped around the hydro corridor. At first this split the community in half but now that the trails are in place, it has become central to the neighbourhood. The Hydro corridor can now be easily accessed within minutes by walking or biking by all residents and it is not something people have to drive to in order to experience it. When Manitoba Hydro announced that there would be additional lines placed into the station, some residents were concerned about the lack of curb appeal this would bring. Other residents had concerns about the safety of the hydro corridor and whether the extra lines would emit larger electromagnetic fields to the nearby homes. 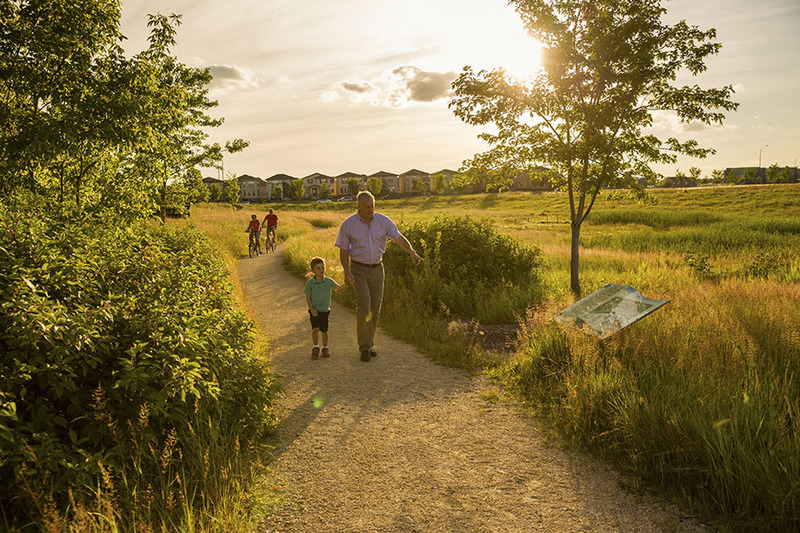 The hydro corridor is now a vital part of the trails woven throughout the community and as Sage Creek’s development heads into phases eight and nine, trails will continue to link with it. The hydro corridor is an essential component of the Sage Creek community, providing it with plenty of power for the future.